Cap n Crunch by Michael Albert. Edition of 6; 56 x 35 inches, Edition of 6; 90 x 60 inches, Edition of 3. Hayes Trotter paints on recycled cereal and snack boxes. The Pledge of Allegiance, 2004 by Michael Albert. Giant Trix box composed of multiple miniature cereal boxes, By Ryan Alexiev. Not green! A promotion for a Honda Civic. The car is ‘the prize’ in the giant cereal box. Marketing agency Dare built a 20 foot tall Crunchy O’s cereal box in Vancouver. Cereal Box Map by Chris Kaasman. Mosaic by Jill Berry made of printed snack, cracker, cereal, and tea boxes. 100 Cereal Box Covers Project – Alan Valek. 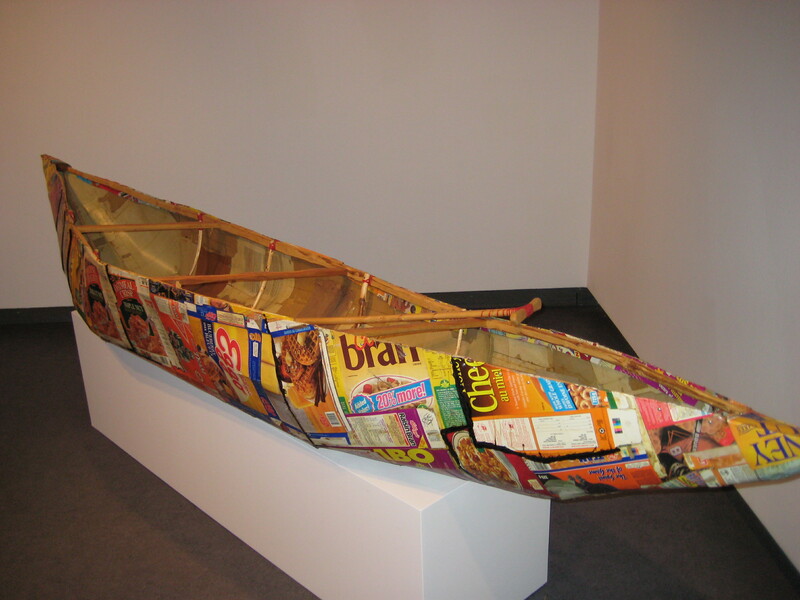 Cereal Box Canoe by Greg A. Hill. Waterproof and usable. Ritz Cracker Box Collage by Michael Albert. Original Apple Jacks Cereal Box Collage, 1998 by Michael Albert. The Preamble, 2007. Prints available. The original 20″ x 30″ Collage Construction took Michael Albert 3 months to complete. It features the initials of all signers of the Constitution of the United States. Racheal says she has been collecting twist-ties since 1998, seems her bread tag collection must be older. Pigmented ink print. Lost in my Life (price tags), 2009, Pigment Print, available: 30 x 20 inches, Edition of 6; 56 x 35 inches, Edition of 6; 90 x 60 inches. Lost in my Life (price tag fabric). Pigment Print, available: 30 x 20 inches, Edition of 6; 56 x 35 inches, Edition of 6; 90 x 60 inches, Edition of 3. Andy Warhol Boxes – 1963-64.